A submersible well pump failing is a frustrating experience for any home owner. Water is something that we all take for granted, we assume that when we turn on the tap that we will have all the water we need but that isn’t always the case. Wear and tear from age, electrical problems, improper installation, faulty equipment or well failures can all cause submersible pumps, water tanks and water systems to fail. Only a licensed well contractor has the knowledge necessary to trouble shoot your problem and then make repairs that optimize your pumping system and ensure the longest possible life. 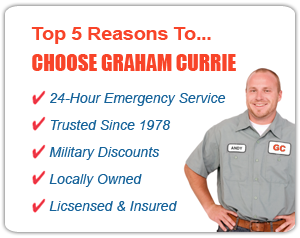 If you have trouble with your submersible well pump, bladder tanks, well pressure switches or water system electrical controls Graham Currie can help. Our crews are on standby 24 hours a day, 7 days a week with full stock service vehicles. Many contractors simply replace damaged equipment without doing detailed checks on your entire water system. This quick fix approach leads to frequent failures and possibly significant damage to your water supply. Without understanding well construction and water supply dynamics no contractor can truly give you a secure water supply. 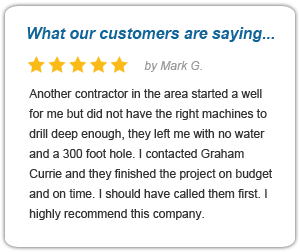 Our team of well experts understand how your well works and that knowledge allows our staff to provide you with the most efficient and cost effective repairs. 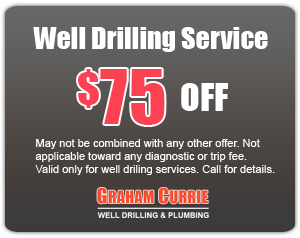 Graham Currie also offers an annual well inspection program; this yearly checkup can helps use to identify small issues and repair them quickly before more expensive problems develop. Taking the simple step to have your well, submersible well pump, bladder tank and electrical systems checked can easily prevent thousands of dollars in repair bills and potentially reduce your monthly power bills in the process.